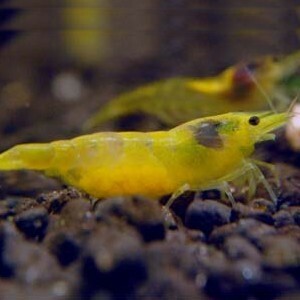 Life Span: 1-2 years Full Grown Size: 1.50"
Gestation Period: 30 days Approximate Purchase Size: .85"-1"
The Yellow Shrimp is a fairly recent color variation of the wild Neocaridina heteropoda. This color variation was originally bred in Germany and started to appear in the Freshwater Aquarium Shrimp hobby in the early 2000's. The care of the Yellow Shrimp is exactly the same as the Red Cherry Shrimp. They are undemanding when it comes to water parameters, as long as extremes are avoided and the parameters are stably maintained. The Yellow Shrimp is an Omnivore. While the Yellow Shrimp is great for aquarium algae control, when kept in larger groups, supplemental feeding is often required. Foods intended for bottom feeding fish and aquatic invertebrates make great foods. Vegetables that have been thoroughly cleaned and boiled until they are soft are also great foods. Breeding Yellow Shrimp in the home aquarium is rather easy. As long as there is a mature male and a female in a well established, well maintained aquarium, they will breed. The male Yellow Shrimp is smaller and a little less colorful, while the females are larger and display deeper more vivid colors. Mature adult female Yellow Shrimp will often display a saddle on their upper back (seen in insert). This saddle is the females eggs developing in her ovaries. Yellow Shrimp are a very non-aggressive species of Dwarf Shrimp. The Yellow Shrimp is very active and will be often seen grazing for algae on plants, decorations and the substrate. They only become shy and hide after molting (when a shrimp sheds its exoskeleton in order to grow or breed). As with all aquatic invertebrates, it is important to make sure copper does not get into the aquarium. Copper is toxic to all Dwarf Shrimp. Many medications contain elevated levels of copper, so it is recommended not to medicate an aquarium containing Dwarf Shrimp.